Juno moves in a new direction. On this day in 1944, the Normandy Landings commenced. One of the attacking sectors- Juno. On this day in 2006, David Wiltshire commenced Juno Web Design, a small one man company and aptly named it Juno, after the D-Day landings, in which his grandfather took part. 6 years later, the one man band is now a thriving company of around 30 employees. Today is an apt day for launches and expansion and with that in mind, today 06.06.2012 we have launched our new site Juno Crates. Juno Crates has the look and feel of our new “Brand”. Clean, clinical, fresh and elite. This is way the whole of Juno Media will be moving. 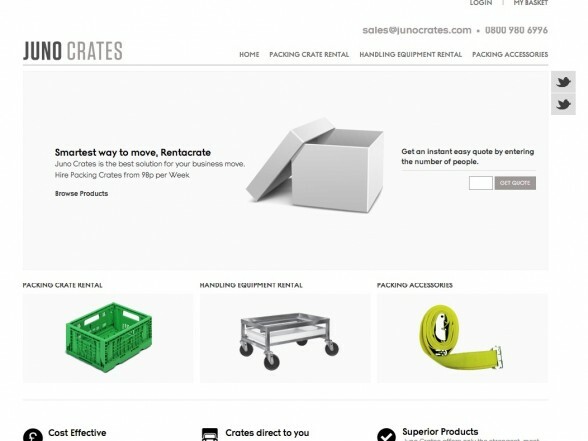 Juno Crates is one of many sites being launched under the “Juno Retail” brand, and will be adapted to become a responsive Magento theme, enabling users to access the site perfectly from a range of devices. Juno Crates offers a range of packing crates and accessories, enabling those people moving home or re-locating their business to hire crates to pack their belongings in. This is a great cost effective way of ensuring items are packed with care and secure throughout transit. We’ve partnered with the UKs leading provider of Teacrates and packaging, to bring the best products at the most cost effective prices. So, if you’re considering moving home, looking for a new venue for your business, or even need to store and archive some items, Juno Crates can offer you a great range of products and solutions. 6 years down the line Juno has grown and continues to grow expanding into all areas of media and retail. Here is to another 6 years and the rest!